Papelbon strikes one more time. In yo face! 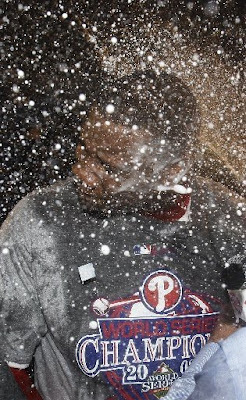 There's a part of me that wants to congratulate the Philadelphia Phillies on winning a World Series title. Even though I have no idea how hard it is to win one (because my favorite team always seems to find a way to choke it up) I do know how EASY it is to f*ck it up. And since the Phightin' Phils didn't do that, I've gotta tip my cap to them. However, it doesn't mean that they're exempt from getting a championship worthy facial! I can't wait 'til next year when Jim Hendry or Lou Piniella gets a load in the face!